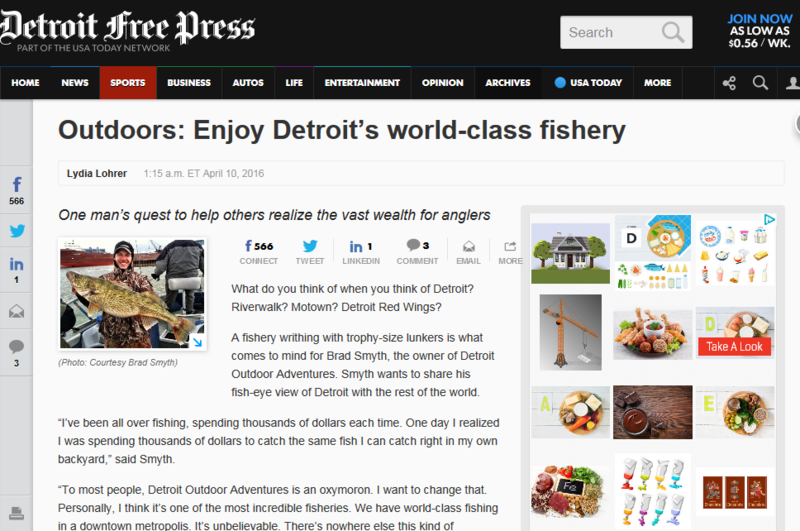 In an article dated 4/10/2016, when asked what comes to mind when you think of Detroit, Brad Smyth, owner of Detroit Outdoor adventures, who knows that there are few better places for world-class fishing than Detroit, answered, “A fishery writhing with trophy-size lunkers”. The article goes on to explain how Brad acquired his love of nature, hunting and fishing when he was just a young boy. He grew up in Sterling Heights but spent most weekends and summers hunting and fishing at the family’s place in Port Hope near the shores of Lake Michigan. As Brad explains to the Detroit Free Press, that’s where his love of fishing began. The experience of spending time at his grandparents’ home in Harbor Beach, Michigan helped Brad develop a strong work ethic and sense of responsibility. Working his way through the ranks of the Boy Scouts only furthered his passion for the outdoors and by the time Brad reached Eagle Scout, he had developed a strong character built upon trustworthiness and good citizenship. The article also found that Brad was a born entrepreneur. As a child, he found a patch of four leaf clovers and sold them to neighbors. He also baked and sold cookies, sold lemonade, raked leaves, mowed lawns and shoveled snow. His parents instilled the value of money and that if you wanted something money could buy, you should earn it. So, by the tender age of just 14 years old, Brad Smyth had saved enough money to purchase his first boat and 8 horse power motor. Brad kept the boat at his grandfather’s home and was on it as often as he could. His love of teaching was inspired by helping his father teach the sport to others. Brad goes on to explain how he has traveled all over the world to fish and hunt and spent quite a bit of money until he finally realized that the best fishing and outdoor recreation was right in his back yard in Detroit. As Brad began to share his love and knowledge of fishing with friends, word began to spread and a business was created that filled a specific need. As Brad discovered, while many people love to fish, few really understand the techniques or have the skills needed to fully appreciate the sport. Today, Brad is a happily married family man with a growing business who believes in giving back to his community. Leftover fish from his tournament banquets are donated to food banks. To book an outing or for more information please fill out the form in the sidebar, on the contact page, or call 586.945.7429, today!